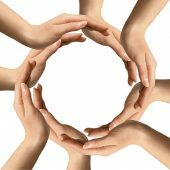 Our Open Circle allows everyone, whether you are an existing church members or just a visitor, the opportunity to use and develop their mediumship skills in a relaxed group of like minded people. Everyone sits in a seated circle. Beginners and trained mediums can then practice by giving messages to one another. Alternatively you can simply choose to just sit quietly in the relaxing energy of the circle. Once a month the circle will be replaced by a ‘Talking Heads’ event so keep an eye on the schedule. I know there’s a principle of spirit. It works without space-time. I am subject to that principle, in spirit and in belief of body. Learn how spirit works, a few simple rules, living a perfect spiritual life is easy. To access rotas you must be logged in as a Google user. Create Account.